The use of dry riser and wet rising mains are intended for use by the Fire Brigade or properly trained personnel, to enable the rapid deployment of water to help fight fire in a building. Dry risers are ‘uncharged’ rising mains with outlet valves on each floor located in convenient positions, such as stair-case enclosures. An inlet valve will be found on the external wall of the building and can also be located beneath the ground floor, so that the Fire Brigade can readily connect into the water supply. A wet riser is permanently charged with water. These dry and wet risers, as well as underground hydrants and hose reels, require regular inspection and some occasional maintenance to ensure that they will be operational in an emergency. Since 1989, it has been the responsibility of a building’s owner / occupier to keep its hydrant systems in good working order. We provide the full range of all the genuine and fully compliant and conformant brigade equipment that will be needed to service dry rising mains. There are a range of inlet and outlet cabinets built to comply with BS5041: Part 5. These are designed to house inlet breechings and landing valves. They have Georgian wired glass panel and spring cylinder lock with key. Manufactured from zintec and epoxy polyester powder coated in red. The landing valves being used on dry rising mains, should normally be of the gate valve type, but globe pattern valves are occasionally used. Theses valves act as outlets from the rising main and are fitted in easily accessible positions such as stair wells on each floor above the first floor of a building, and can sometimes also be located in deep basement areas. Here are some 2.5″ instantaneous female outlet to BS 336, blank cap and chain, strap and padlock. 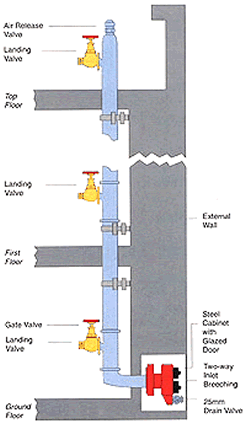 Dry riser gate valves have to comply with the requirements of BS 5041:Part 2. These valves can be mounted in the relevant boxes that complying with BS 5041:Part 4. ๏ Inlet flanged 2.5″ BSP or 3″ BS Table D or 65mm BS 4504 Table 16/21. ๏ Inlet screwed 2.5″ BSP. Globe Pattern Landing Valves (LP). These screw-down stop valves are primarily used as hydrant outlets on wet rising mains, occasionally these are used on dry risers, however these are under special circumstances and after discussion with the relevant fire brigade. ๏ Gunmetal bodies, major working parts in manganese bronze. ๏ Comply with the requirements of BS 504:Part 1 and BS 5154. ๏ Outlets are 2 1/2″ instantaneous female to BS 336 and inlets flanged or screwed as required. In this picture is the anti-tamper leather strap used with globe valves and can be fastened using the 3/4″ brass padlock. Other accessories include a replacement washer and an air release valve for use at the top of a hydrant system. Air valves are fitted at the top of a riser to release air when the riser is charged with water or to admit air when draining off. ๏ Screwed 1″ BSP male. Blank plugs are used to seal off water supplies and prevent dirt entering the valves or connectors. Blank plugs are 2 1/2″ instantaneous male type. Gunmetal and aluminium blank plugs are pressure resistant; plastic and rubber blank caps act as dust cover only. Dry riser inlet breechings are normally fitted in glass-fronted cabinets on the outside walls of buildings and have either two or four inlet connections. For special requirements, a single inlet breeching is available. They are used to feed water into the rising main through 2 1/2″ fire hoses. A 100mm (4″) rising main uses a two-way inlet breeching and a 150mm (6″) main uses a four-way inlet breeching. Drain Valves to BS 5154. Normally fitted to inlet breechings but can be supplied separately. 4″ BSTD, 4″ BSP parallel female or 100mm NP16 Ð can be mounted either horizontally or vertically. Complies with BS 5041 Part 3.